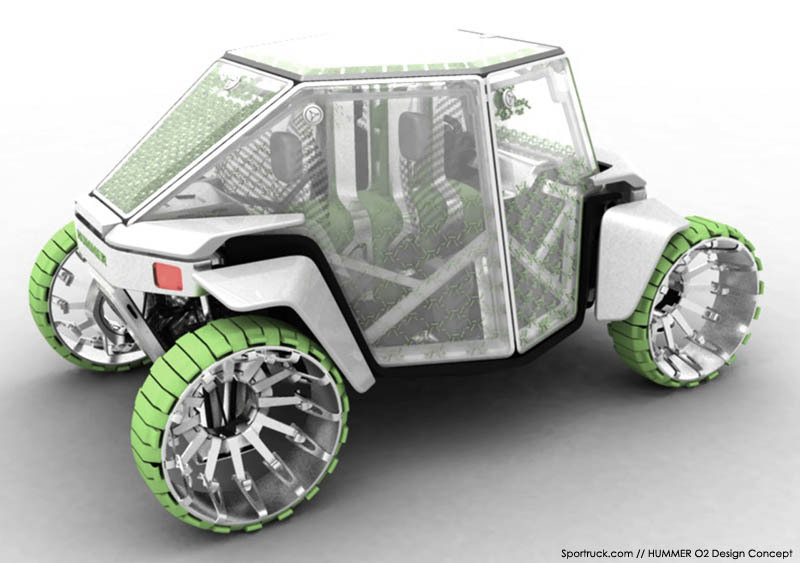 What might automobiles look like 15 years in the future? That is the question posed to Los Angeles automobile design studios, representing almost every major automobile manufacturer. The contest, called the Design Challenge, is part of a automobile design conference featured at the LA Auto Show. The Los Angeles area is home to 15 automobile manufacturers' design studios, all within 120-mile radius of one another. This year nine of those studios participated in the contest. 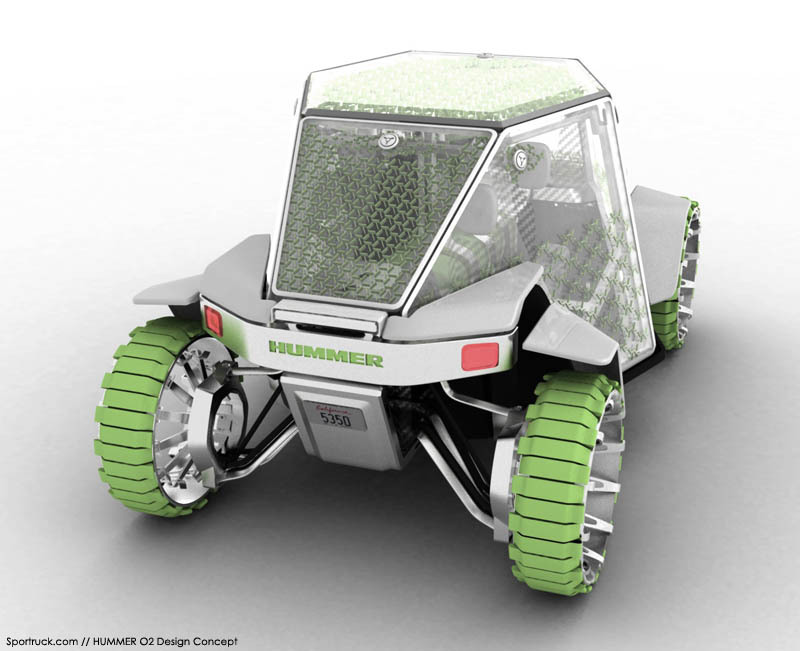 Each of the design teams was instructed to create a vehicle that is environmentally aware of its global footprint. Each vehicle has technology to allow the public to enjoy the distinctive Southern California lifestyle and unique environment without harming it. The entries were judged on the following criteria: originality of creative concept, contribution to the environment, degree of safety and reflection of a unique, spirited Southern California "green" lifestyle. 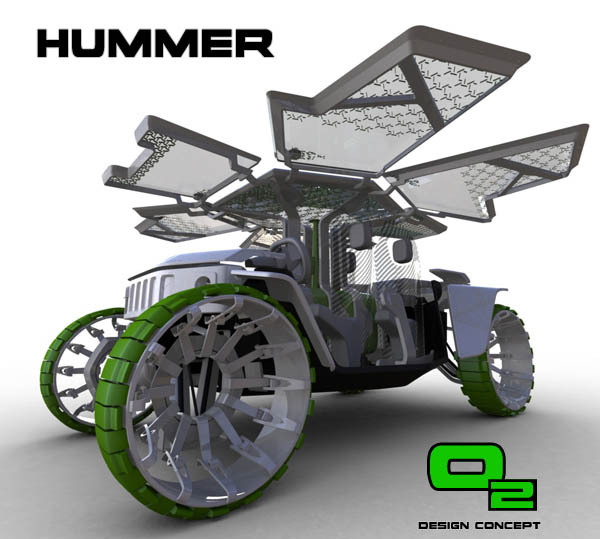 This year's winner is the HUMMER O2 Concept, an entry from General Motors West Coast Advanced Design Studio in Hollywood, CA. Their two-dimensional renderings were chosen by a panel consisting of multi-discipline design professionals from the leading Art and Design Schools from the area. The contest required that vehicle entries be 100-percent recyclable and have a lifespan of just 60 months. 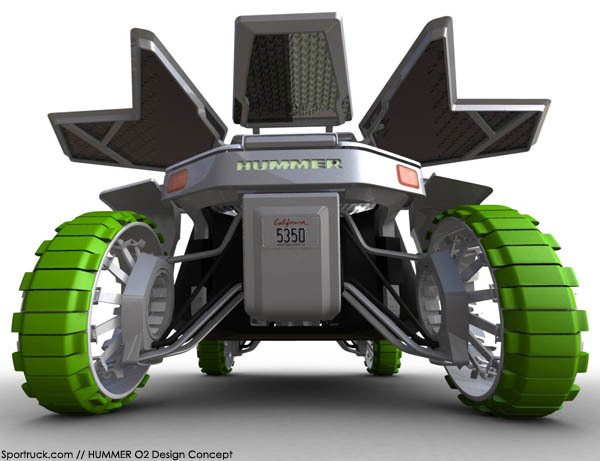 The HUMMER O2 concept took that a step further, by producing a vehicle that produces a "net gain" for the environment. The team drew upon inspiration from trends in green architecture and the concept of minimizing an individual's "carbon footprint." The key to the HUMMER 02 Concept is a revolutionary phototropic body shell that produces pure oxygen throughout the life of the vehicle. 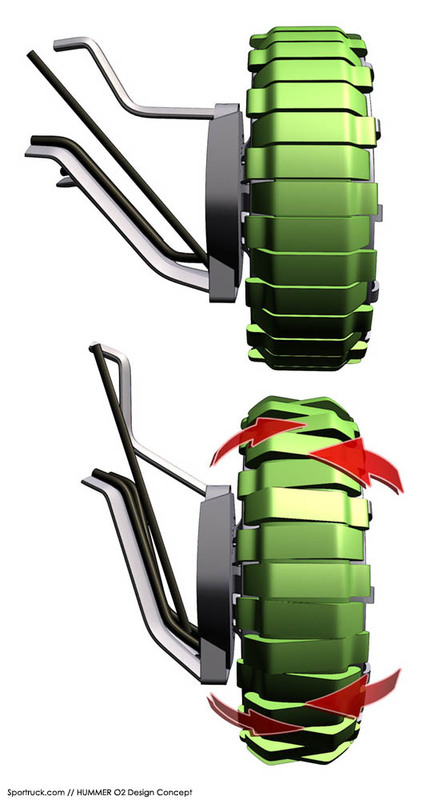 Algae-filled body panels transform harmful carbon dioxide into pure oxygen that is subsequently released back into the environment and inside the vehicle. "The panels essentially function as the 'leaves' of the HUMMER O2 and effectively clean the air in the surrounding environment," said Saucedo. "Used algae are recycled as biomass for the further production of energy." The flow of CO2 and oxygen is regulated by a two-way valve system ("Mistic Devices") in the corner of each panel. These sophisticated devices control and monitor the amount of CO2 and source nutrition needed for the algae cultivation and optimize oxygen production and distribution. A central aluminum "tree" creates a perfect hexagonal structure that both protects the central hydrogen tank and supports the external structural body panels. The stiff body panels transform the tree intro a safe enclosed spaceframe taking care of side impact protection. 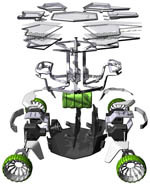 Front and rear caps connect the powertrain and suspension ("roots") firmly to the "tree". 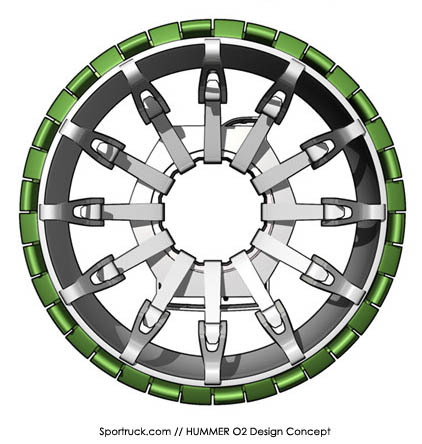 To help further reduce environmental impact, the HUMMER O2’s construction specifies the use of 100-percent post-consumer materials, including an aluminum frame, seats finished with Volatile Organic Components-free (VOC-free) materials and glazing via PETE (similar to everyday consumer packaging, such as soda bottles). 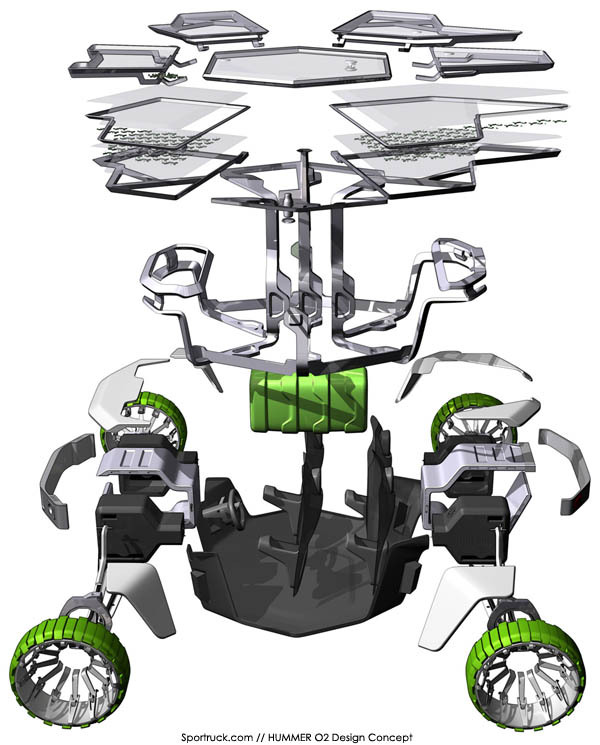 Four modular and self-contained fuel cells power the hydraulic motors attached to each wheel. New water-based hydraulic fluid is used. 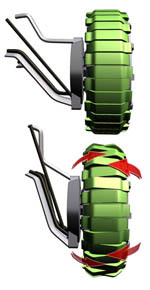 The hydrogen tank is found in an ideal central location for both safety and structural purposes, becoming this way the literal and metaphorical “heart” of the vehicle. 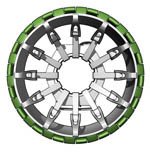 Active Tread tires provide low resistance on the highway while allowing excellent off-road progress as their shape changes – adapting to and protecting the soil. "The HUMMER O2 epitomizes the ethos of the true Southern California outdoors enthusiast with rugged capability, a 'tread lightly' contact system and construction methods promoting safety, accessibility and reusability," said Frank Saucedo, director, GM Advanced Design in California . "Most vehicles in L.A. spend 95 percent of their time outdoors subjected to sunlight, so why couldn’t a vehicle give back?" 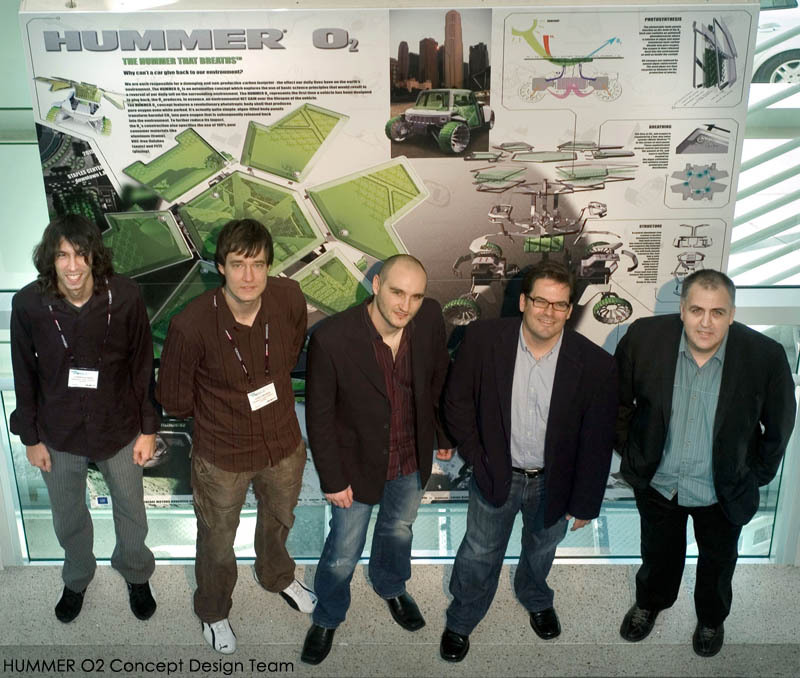 The GM West Coast Advanced Design Studio also won the 2005 Design Challenge competition with its GMC PAD Concept, a mobile urban loft designed for the L.A. environment. You can view the contest entries at the LA Auto Show, running now through December 10, 2006 at the LA Convention Center.